You’re probably wondering what on Earth does one mean by Writer Fashion? As in, what would writers wear to their book launches? Or would they wear if they got invited to Book Award ceremonies? Or is it something else? Well, no. Writer fashion is what you wear when you’re writing. Usually, I like wearing my lose pajamas and baggy t-shirts. But sometimes because I am so annoyed or just cannot calm down my mind enough to write, I dress up. It’s a good way to make yourself realize you need to start working. And maybe it’s psychological but if you are dressed up enough you tend to want to work more. Your brain snaps out of the lazy mode and begins working. So I am either dressed to the nines when I am writing my stories or I am not. There’s no in between for me. Because when I am feeling utterly lazy, getting dressed up is a good way to trick my brain into thinking that I am about to go out and I really need to be at the top of my game. So, sometimes I will wear the fanciest of clothes and sit down to write! I know it sounds really strange but it has helped me meet a lot of my deadlines. Some days I come home from work bursting with inspiration. Other days, I need to go after the inspiration with a club. I have to jumpstart my writing. Unfortunately what most people don’t understand is this: writing at the end of the day is a job. So matter how we might be feeling, we have to get up and sit down to write. And sometimes, in order to make ourselves feel more inspired, we get into the fanciest of clothes and let our minds take us dancing into the prettiest part of the city. 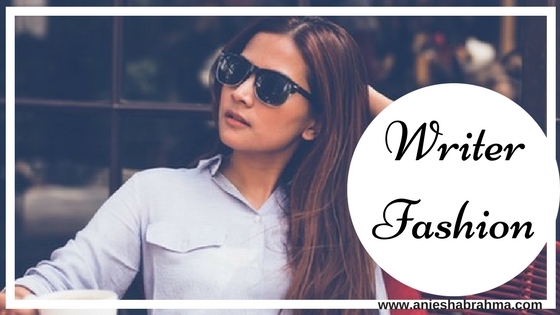 Do you have a particular writer fashion? What do you wear when you’re hammering away at your laptop? Are you a jeans and t-shirt kind of writer? Or do you like dressing to the nines? Let me know in the comments below! writing is related to mind,if someone says writer fashion,its like wearing makeup for radio show.do people see your make up on radio,same is with writing which is related to thoughts of mind.i wear just shorts at home,i don't even wear shirt in summer.i wear according to weather and not for writing something.what inspires me while writing? am not a superficial person ,so whenever i want to write,i close my eyes for a second and my mind travels at million miles per second into past,present and future and gets me few lines.after writing few lines again i close my eyes and this time my mind travels in different direction and dimension. thats how true introverts write.while thinking/writing i don't feel my body,am made of more soul than body.MY QUESTION AGAIN,WHY DO YOU NEED FASHION FOR SOUL OR MIND WHICH IS MAJOR ASPECT OF WRITING. I am very much delighted to read your post. I must say you have a huge entertaining information packed blog. And your story is so inspiring to us all. Keep posting.